On the 4th May I am taking my Dad to Germany to ride the 200km from Leipzig to Berlin. We are joining the 'Peace Race Tribute' ride. The peace race was, in the USSR era, the Eastern bloc equivalent of the Tour de France. Two riders, Alan Buttler and Geoff Wiles, are riding the entire 2200km route of the 1955 Peace Race to raise money for Diabetes UK. Alan is organising the ride as a tribute to his father, Alf, who died of diabetes. Alf was manager and mechanic for many British teams in cycle races over 25 years. His first race with the British team was the 1955 Peace Race. 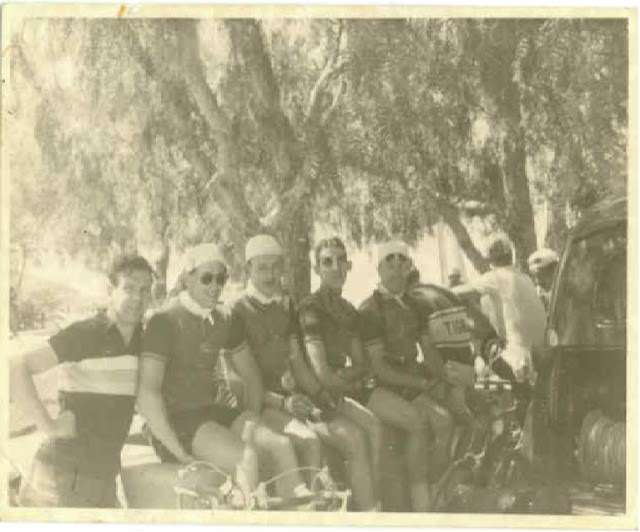 The picture attached below shows Alf (far left) next to my Dad in 1960 on the Tour of Tunisia. My Dad also rode the Peace Race in 1962. Alan Jacob, rated by former British Champion David Bedwell as one of the two most "dangerous men" to face in a sprint. It is great that we will again have Positivo Espresso riders involved in epic events on two continents during the first week in May. Stay tuned. He is easy to spot ... in the leader's yellow jersey.